Features Resists heat, heavy impact and scratch proof. We are long-time established manufacturer, distributor, importer and exporter of Industrial FRP Helmet. Our FRP Helmet with Chip Strap are being exported to global regions like of Middle East, Africa, South Asia, Latin America, Europe, Bangladesh, Bhutan, Nepal, Sri Lanka and many more. I. Helmet shell made up of reinforced fiberglass polyester resin. II. The cotton head band or 4 point plastic suspension gives the helmet a secure well balanced protection. VI. 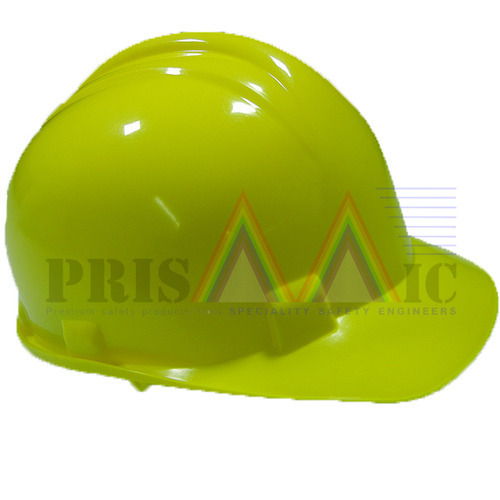 Our FRP Safety Helmet with Ratchet Fitting follows industrial norms like it is Approved And Certified: DGMS / BIS : 2925. VII.FRP Helmet with Nape Strap provides adequate protection to a person working in adverse working conditions.